I am beyond outside the box. I cannot do things like normal people. I guess that is why I am an artist. I always find my own way and come up with innovative solutions to complex problems; and one more thing, I always have to be extreme. My new project, Childhood Fractured, is no different. Things are not moving as fast as I want them to. I am deciding to take it to the extreme. It is difficult to articulate just how angry I become when I think about how little is being done to prevent and combat child sexual abuse. Innocent children are being raped, molested, and exploited every night, right in your neighborhood. Instead of judging what I am saying, do the research yourself and see just how staggering even the most conservative statistics really are. I feel the pain of every child who is being violated right now; their childhood being fractured. I talk to people every day about the horrors they experienced as children. I firmly believe that anyone who is a survivor of child sexual abuse is obligated to take action. We are all responsible for the children of this world to a degree. We are obligated to protect them. There are so many of us out there that were victims, and now we have blossomed as survivors. I do not expect every person to do as much as I am, but I do expect them to do something. We need to build an army of warriors to end child sexual abuse; this army needs to be made up of survivors. We need to look past what happened to us, and do something about our future. We need to protect all children. We need to mount an offensive against this silent pandemic. If we don’t, then who will? This will be a war not that will not be won in our lifetime, a war with no guaranteed victory, but a war we must fight. We can make a difference! We can measure our progress and learn from our failures! The innocent children of our world without a voice are worth the sacrifice. Therefore, I have decided to bring to light my endeavor, through a month long fast. Throughout my life, I have done countless and ambitious fasts. First, for four days, I could drink clear liquids. Then, I started a one day fast during every month. In a desert hugging the Mexican border, I did a seven day onion-garlic joint fast with my wife Dawn. We shared that wonderful experience. The longest fast I have ever done was a thirteen day juice fast. Every fast I have done has been for me, either for a reboot or search for enlightenment. This time I am fasting for a cause. I will fast every day until I raise $500 every 24 hours. I will have the days run from 8am to 8am. If I raise $500, I will eat a meal and start again the next day. 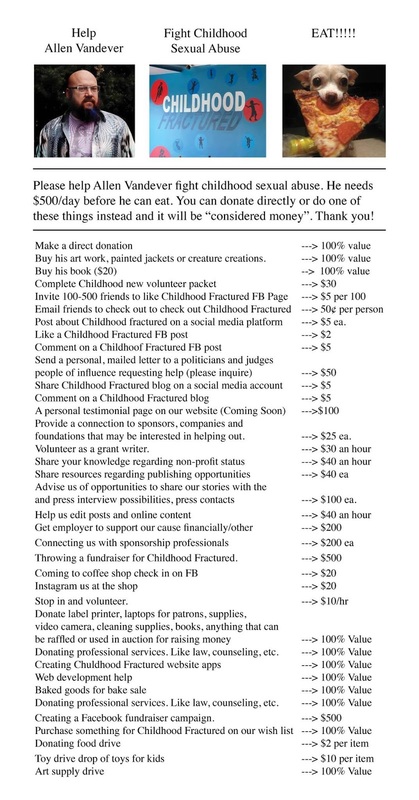 I will do this until I raise $300,000 for Childhood Fractured. What will the money be used for? Running Chicago’s only FREE COFFEE SHOP. -Creating very-needed & necessary standard protocols for the public about the issue. This means educational pamphlets for parents whose children were sexually abused. It will give them procedural information on what the nexts steps are and how they can get proactive. -Creating a network to connect organizations that are working towards ending childhood sexual abuse. I have thought about white privilege a lot this year. A fact is that I have never once gone hungry in my life except out of choice. And that is an incredible privilege! I have had nourishing meals to keep me well fed and fueled every single day of my life. I throw away way too much food. I waste it. It is a mark of great class privilege to be able to literally pop something delicious and nourishing in my mouth every time that I am hungry. Hunger strikes have been used by throughout time to highlight inequities in society. Not only is it a tool for us to get our message out to the world, it is something so drastic that is bound to cultivate action. People who are down for any cause can put their bodies on the line to expose how urgent the situation is. Past documentations have proved its effectiveness. The urgency is evident when people ask, “What would make people starve themselves?” People become inspired when they see that people are willing to sacrifice their bodies for a purpose.